Tomorrow marks Women’s Equality Day – a day set aside to celebrate the passage of the 19th amendment to the constitution – the amendment that would immensely change women’s roles in the United States. But while gaining the vote, which took years of diligence and planning, was surely a gigantic step toward equality, there were still years of struggle. And years of work remain. 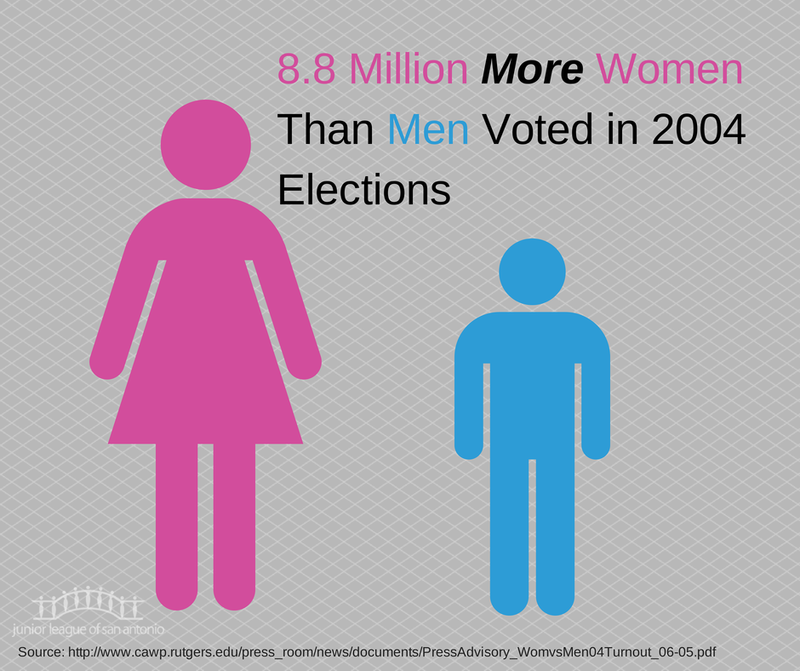 Even though women can vote (and have voted at higher rates than men in every presidential election since 1980! ), we still only make up approximately twenty percent of both houses of the United States Congress. More and more of us succeed academically, yet on average, we still make less than our male counterparts. We might be called bossy while he is called boss. We are surrounded by double-standards, many of which are so entrenched in our culture that we do not even notice them. Some may think this an oversimplification of a complex issue, but each of the above examples serves to illustrate that we have yet to achieve true equality – that despite an incredible amount of progress, women must continue to strive for equality in a country whose doctrine claims us all equal. This work is why organizations such as the Junior League of San Antonio, Inc. are still so important and relevant. It is why I am so proud to serve JLSA. There are three parts to our mission, but the one that stands out as unique to us is “developing the potential of women.” We are uniquely positioned to assist women, both our members and those in the community we serve, to reach new levels of success and empowerment. I owe my own development as a leader to JLSA, which is why my passion grows daily for the potential of what this organization can achieve. My participation in JLSA means I am surrounded by amazing women who not only learn to empower themselves, but empower those they serve as well as those they serve with. But this work we do is not only beneficial for women. It is not only beneficial for children for that matter. It is beneficial to everyone in the community. This is because when everyone is empowered to be successful, takes care of their families, and reaches their potential, the entire community wins. Instead of being men and women, we become humanity – a group of people working together on equal footing to make our communities safe, productive, and enjoyable. But until that day comes, Women’s Equality Day should not just be a day of celebration. This day is a reminder of how far we have come and how far we have yet to go. Our awareness of equality issues is heightened and we are inspired to face them head on. We are encouraged that anything is possible but we have to push to achieve it. So each year, on August 26th, mark Women’s Equality Day, but work each and every day of the year to fulfill the ultimate goal of true equality.